Upper Canada College has a wonderfully vibrant and diverse arts program which offers our sons’ incredible opportunities to explore their creativity. The Arts Booster Club (ABC) is comprised of parents, faculty, students and Old Boys who seek to celebrate the tremendous creativity of UCC boys. Parent volunteers on the ABC board representing each art discipline seek opportunities to promote participation of arts students in school events, showcase the boys’ work and invite successful role models to share their experiences with the boys. Read about the boys’ fantastic work via UCC communications or enjoy it first-hand at the Nuit Bleue Spring Arts Festival. You'll be dazzled. Art parent representatives are the foundation of the ABC and fulfil a key role in keeping arts parents informed of upcoming activities. 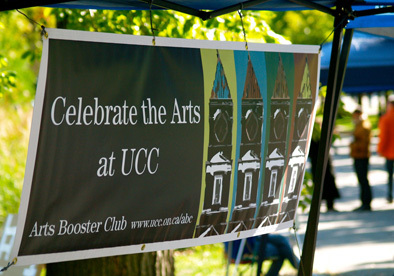 The ABC relies on parents, faculty, staff and Old Boys to share news, photos and videos of successes in the arts inside and outside the walls of UCC. The ABC also works with the head steward, creativity steward and UCC administration to coordinate the participation of arts students in school events and assemblies. Occasional volunteers to take photos, video or help out at special events are needed too. Email webmaster@ucc.on.ca for details.